I've got a Star Adventurer (SA) with a Zenithstar 61 APO. The highest exposure time for a single subframe that I can created before the star-trailing kicks in is around 1.5 min. My question is; "Is buying a small auto-guider (that fits with a Star Adventurer) worth it or do I need to accept the fact that I can't take longer exposure sub-frames with my current equipment?" I currently use an iOptron SmartEQ Pro+ which has the same payload capacity as the Star Adventurer. My scope is a WO ZenithStar73 so the big brother of your 61. I recently started guiding using a QHY miniguidescope (4.2oz or 120 grams) and a ZWO 120mm mono guide camera. It's a pretty light guiding setup and I've been able to get 5 minute exposures with good polar alignment. I stick to 2 minutes because of the light pollution where I live. I'm pretty impressed at the scope and camera for the little weight it adds. 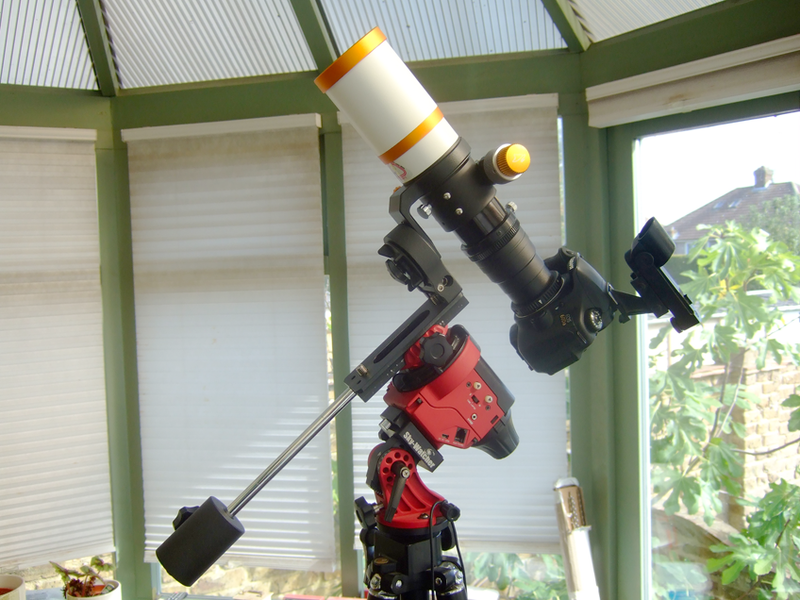 ZWO makes a 30mm guidescope but it appears to be heavier…same with Orion. I figured the QHY would be great for my focal length, and when I upgrade to a larger aperture my Z73 will be the guidescope. The SmartEQ Pro+ can be guided in RA and DEC, the Star Adventurer only in RA. So your polar alignment has to be good enough to keep the DEC drift within your limits as you can´t correct it. I guide the Star Adventurer with a Orion 50 mm Mini Guide Scope and a Lacerta MGEN II autoguider, and I can easily take exposures up to 240 s without problems. Have a look here: https://www.star-watcher.ch/equipment/lacerta-mgen-auto-guider/ for more details of how to configure the autoguider for the Star Adventurer. Thanks for the reply and link you've send along with it. I'll take a look into it, from looking at your photo's it seems promising. First of all; I'm very impressed by looking at your photo's and seeing what you've achieved with only 30sec exposures! I've found that balancing the Z61 was fairly impossible without turning around the little stand what you use for attaching it to your SA, as seen in the picture that I've send along with this reply. Another problem that I've found was that I didn't "level" the crosshair. I don't really know how to explain what I mean by this so I attached another picture with this reply in the hope you can see what I mean. I hope this all helps, if not, please feel free to send another message. Oh thanks a lot for your tipps I really appreciate!! As soon as i will get the opportunity to go out for astrophotography i will try out!! My two cents to this interesting thread : with my iOptron SkyGuider Pro, to "level" the reticule and reduce the misalignment as shown by Twan, I usually first move Polaris along the "0-6" vertical axis up and down several times, by turning the latitude adjustment knob. The star should follow this vertical line as close as possible, but if it doesn't, I slightly rotate left or right the RA mounting bloc where the polarscope is mounted, until I reach a satisfaying level. After that, I go on positioning Polaris exactly based on the chart I get with a polar alignment app (iOS) for example. I usually first move Polaris along the "0-6" vertical axis up and down several times, by turning the latitude adjustment knob. The star should follow this vertical line as close as possible, but if it doesn't, I slightly rotate left or right the RA mounting bloc where the polarscope is mounted, until I reach a satisfaying level. This is a nice tip Christophe! Mind that it requires the tripod/mount to be perfectly level. Hi all,My two cents to this interesting thread : with my iOptron SkyGuider Pro, to "level" the reticule and reduce the misalignment as shown by Twan, I usually first move Polaris along the "0-6" vertical axis up and down several times, by turning the latitude adjustment knob. The star should follow this vertical line as close as possible, but if it doesn't, I slightly rotate left or right the RA mounting bloc where the polarscope is mounted, until I reach a satisfaying level. After that, I go on positioning Polaris exactly based on the chart I get with a polar alignment app (iOS) for example. Yes, you're right! It's also important to check if the polarscope optical axis is perfectly aligned with the RA axis of the mount. This procedure can be easily done during daytime by pointing to a far-away terrestrial target such as electrical pylon, bell tower. Never give up polar alignment ! Great tips on the polar alignment scope. One more note, it is ok for the whole image to shift around as you rotate the mount, as long as the crosshairs stay on the same exact object (like the top of the pole in the example). I thought at one time that the image shift caused issues with my alignment, but it does not. 1. Use PS Align app (Free) to see exact where Polaris is. 2. Take out tripod and tracker before dark so can more easily check is level. I made scratches on garden stones so set tripod in sameplace each time. 3. I like do alignment right at dusk when Polaris visible but other stars in area are not. 4. After mount camera and before begin exposures I do quick look make sure alignment still good. 5. After first two shots I remove card from camera run inside and check make sure tracking is good. Mistakes I have made include, rushing, align wrong star, forget charge camera or tracker, not level, trip over tripod in dark. One more thing about the PS align app, make sure you select the correct mode for the polar scope in the app. One of them is visual, the other is telescope I think. If you choose the wrong one Polaris will be in the wrong quadrant for the polar scope. I can't remember which option to choose for the polar scope, I think it should be telescope (can't remember if the polar scope images are right side up or not). LOL all of these plus cat playing/messing with hanging cables, me forgetting the lens at f/22 (can't blame the cat for that! ), forget connecting the camera to the snap port, or shoot with tracking off, and the list goes on… you know, Murphy's Law. Seriously now, Twan and Christophe have posted some great info here! Thanks! Yes tracking off, done that also! On positive side my swearing has improved a lot! Another "highlight" is imaging without inserted memory card! I will keep that one in mind Harald! Sigga, Canon has a setting which prevent you imaging without memory card, as I learned afterwards.